Enjoy warm out of the oven! I hate to be a bad influence, but I have had a major sweet tooth lately. I know you are trying to stick to your new year resolutions by working out and eating healthy, but it doesn’t hurt to splurge every once in a while… as long as you don’t eat the whole batch. It might be kind of hard though! Preheat oven to 350 degrees. Spray baking sheets with coconut oil non stick spray; set aside. In the bowl of an electric mixer fitted with the paddle attachment, cream together coconut oil and sugars. Add eggs, one at a time, mixing well after each addition. Reduce speed to low and add both flours, baking powder, baking soda, vanilla, and chocolate; mix until well combined. 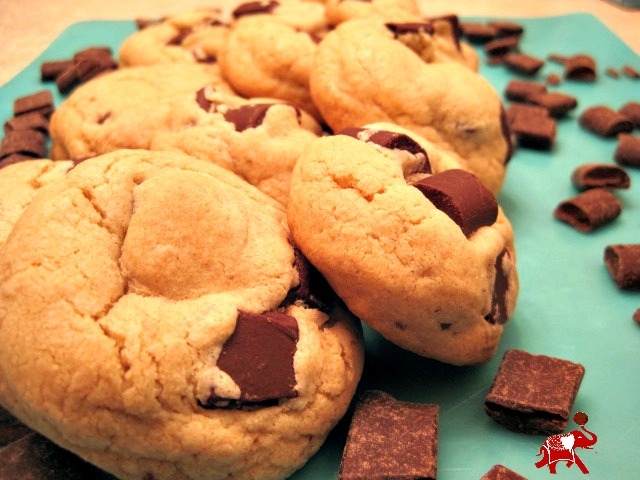 Using a 4-ounce scoop for larger cookies or a 1-ounce scoop for smaller cookies, scoop cookie dough onto prepared baking sheets, about 2 inches apart. 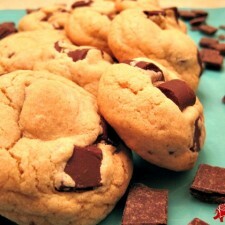 Bake until lightly browned, but still soft, about 20 minutes for larger cookies and about 15 minutes for smaller cookies. Cool slightly on baking sheets before transferring to a wire rack to cool completely. Enjoy!